Following a suggestion of then Trustee, Billy Rogers, the CFMT established a Veterans Memorial Committee and charged them with the design, fund-raising, and creation of a memorial to honor all veterans. The committee worked for several years to increase awareness and raise funds for the memorial. Once sufficient funds were raised and an agreement was in place with the Township to allow the land just east of the administration building to be used, construction began. On July 26, 2008 the memorial was dedicated. The dedication began with the National Anthem and was followed by a jet flight salute overhead on the final note. The keynote speaker was one of two living Medal of Honor recipients from Ohio. The Memorial is a lasting thank-you for all the sacrifices our veterans have made for our country. 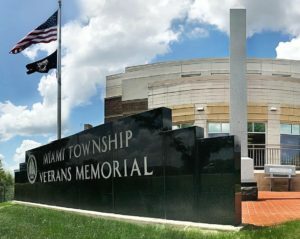 It is a 16′ grey granite obelisk with a black granite wall with the service’s emblems engraved on the back and “Miami Township Veterans Memorial” engraved on the front. The area is surrounded by commemorative brick pavers honoring veterans. The sale of pavers helped fund the construction of the Memorial. 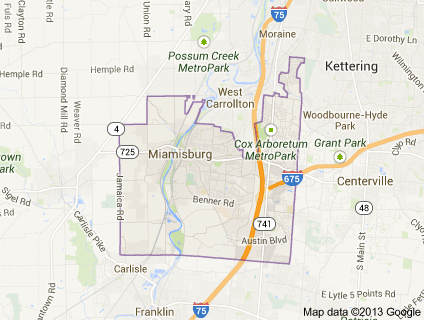 Following the dedication, the Trustees of Miami Township have hosted a very successful Veterans Breakfast each year.